There have been plenty of warnings about Canada's aging labour force, but a new report suggests the working population in Alberta will remain relatively young — and become increasingly diverse — in the coming decades. Alberta's two largest cities already enjoy the highest labour force participation rate among major population centres across the country, according to the Statistics Canada report, released late last week. The rate is defined as the percentage of people aged 15 and over who are working or looking for work. Alberta's rate was around 72 cent in 2017. That's projected to dip slightly to 71 per cent by 2036. The national rate, meanwhile, is expected to fall as low as 62 per cent by then. "This is largely the result of population aging, as the large cohort of baby boomers enter their retirement years," Statistics Canada said in a release. But the effects of this mass retirement won't be felt equally across the country. The report projects a growing gap between urban and rural areas in particular, with young Canadians and immigrants flocking to major cities, while smaller communities grow increasingly older by comparison. Outside of major cities in Ontario, for example, the labour force participation rate is projected to fall to 58 per cent by 2036. In Atlantic Canada, smaller towns are rural areas could see their rate drop as low as 53 per cent. In Alberta, by contrast, the rate outside of Edmonton and Calgary is projected to be a relatively strong 68 per cent in 2036 — just barely behind that of the province's big cities. One reason for this is immigration: Statistics Canada expects newcomers to Canada will increasingly choose to make their homes in Alberta. In 2017, about 31 per cent of people working in the Calgary and Edmonton metropolitan areas were born outside of Canada, according to the report. By 2036, that's projected to grow to 43 per cent. "In these large urban areas, high immigration as well as the migration of young adults from other regions of Canada would partially offset the effects of population aging," the report said. "By 2036, the ratio of labour force participants to non-participant seniors could be at least three in Montreal, close to four in Toronto, and close to five in Calgary and Edmonton." Mount Royal University economist Anupam Das said he was "not at all surprised" by the projections. "When immigrants come here, they will tend to come to the cities," he said. This is a pattern across the country, Das said, as immigrants tend to be attracted to the job opportunities, amenities and diasporas from their countries of origin that are more often found in Canada's urban centres. Still, the Statistics Canada report said immigration growth is expected in other parts of Alberta, as well. 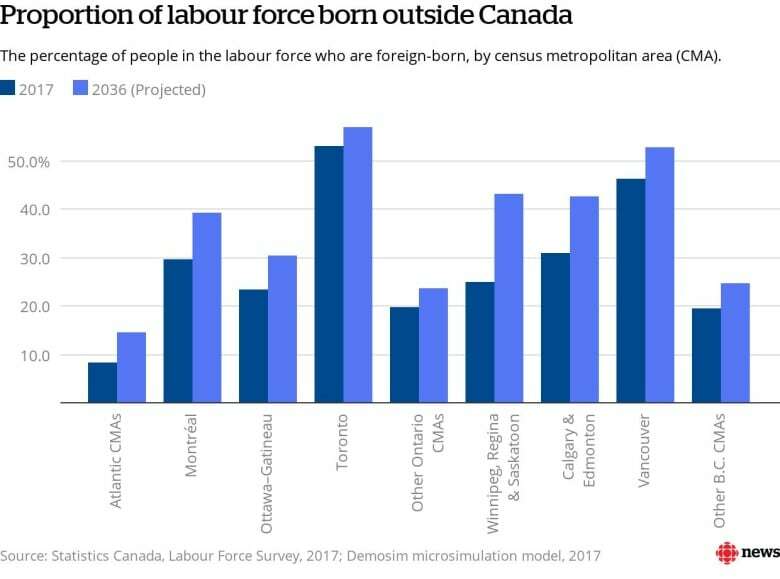 Outside of Calgary and Edmonton, about 12 per cent of the province's working population was foreign-born in 2017. That's projected to increase to 18 per cent by 2036. "I think immigrants feel that, on average, Alberta is a good province to move to," Das said. He cautioned, though, that just because more people are participating in the workforce doesn't mean more people are necessarily working. "We need to be careful because if labour force participation goes up and we fail to absorb those additional workers, then it's possible that unemployment will go up," Das said. That's because the measure includes people who are looking for work, he said, and if they can't find jobs — or can only find low-paying or part-time work — then the economic benefits are limited. "We should actually try to utilize that additional work force, and we can do that by creating more jobs," Das said. "If people end up finding full-time jobs … then that's actually really good for the economy."